The “Check Engine” light (CEL): anyone with a relatively modern car will, at one time or another, see that orange light come on. What does it mean? Is the engine is going to blow up? Has the gas cap not been put on properly after the fill-up? WHAT DOES IT MEAN?!? The only way to know is to use an On-Board Diagnostic (OBD II) reader and pull the code from the car’s diagnostic system. However, as the problem may be temporary, it would be great to be able to turn off the CEL and see if it comes back. While many OBD II units can pull the codes from the car, not all of them can reset the CEL. The one we had been using is the CarChip from Davis Instruments. Our only gripe with the CarChip is that it is PC only. Recently, a reader told us about K Solution’s wireless LELink reader. It is wireless and supported on both the iOS and Android mobile platforms, so no laptop needed. Hey! That is what we have been hoping for from the CarChip folks!!! 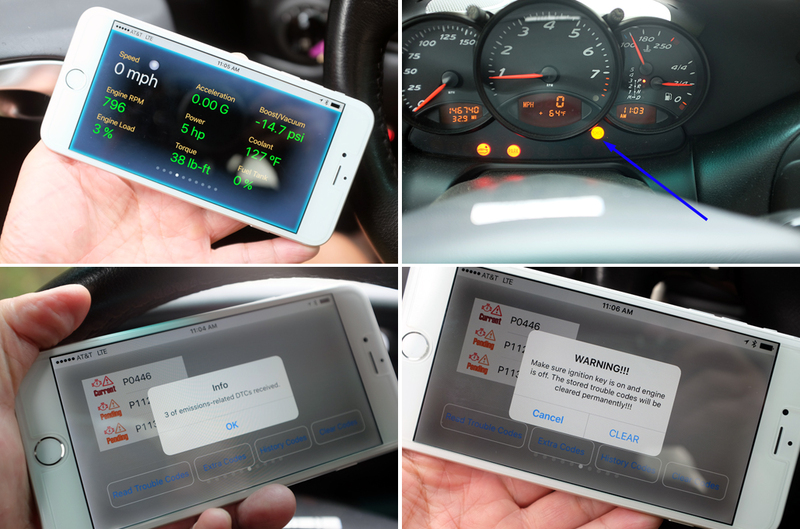 We took a look and the LELink wireless OBD II reader with iPhone support and it is exactly what we had been hoping for ever since we encountered our first CEL. Even though the LELink reader is super-simple to use, it can be a little confusing at first as it comes with no directions. 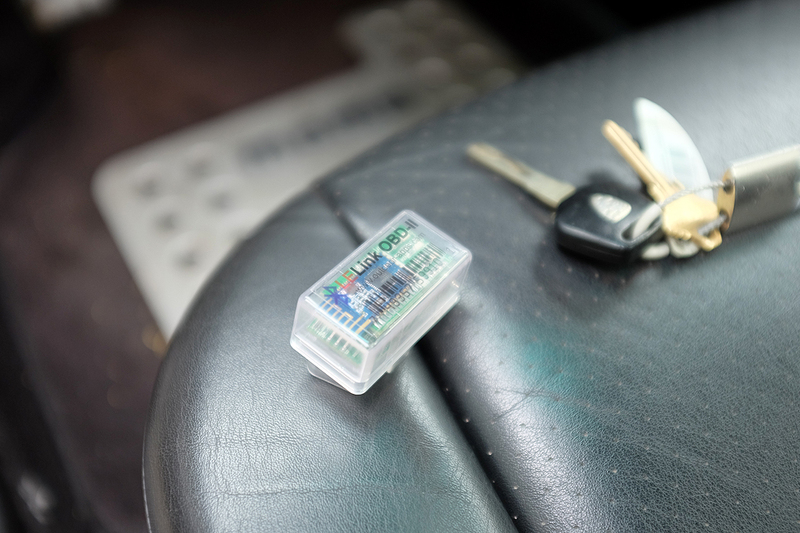 We knew enough from our previous encounters with OBDII incidents that we were able to fumble our way around and get it working in short order. Click “Clear Codes” button to clear the codes. The LELink reader is a Bluetooth (NOT WiFi), but it does not pair via the iPhone’s typical Bluetooth pair procedure. It pairs via the button inside the LELink app. Launch the LELink app – Select LELink and hit Connect. We started working on this write-up just after we had lot of work done on the Boxster, and cleared some recent codes, so we figured it would be a while before the the opportunity arose to use the LELink. Unfortunately for us, the CEL came back on less than 20 miles after we had the Air/Oil separator replaced. Fortunately for our readers, we can now show how to grab the error codes and reset the CEL using the LELink app. 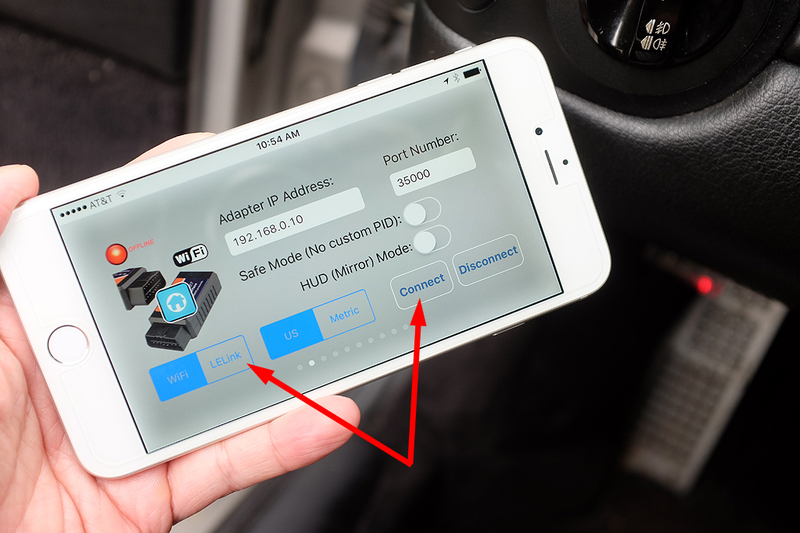 The data collected by the LELink reader is available and viewable on the LELink app when the car is turned on, regardless of whether the engine is running or not. With the engine on, RPM and other data will be automatically displayed on the relevant screen. One of those screens lists the CEL codes being thrown and is self-explanatory. Resetting the CEL was as simple a clicking a button. A warning appeared to remind us to turn off the engine, but leave the key in the “On” position. This is so the LELink’s reader and app can communicate. With the codes cleared, the light on our dash disappeared. We confirmed that no codes were still in the car’s memory by grabbing the error codes again via the app, and as expected, got the “No Codes” message. NOTE: While the CEL codes may be obtained whether the engine is running or not, they may be cleared ONLY in the car on/engine off situation. Reading and clearing CEL codes are two of the benefits of having an OBDII reader. 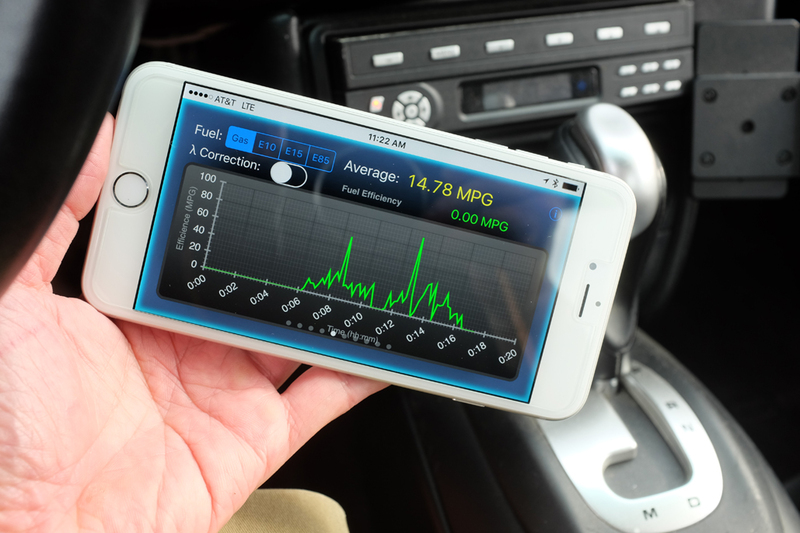 The other benefits include the ability to easily monitor a car’s performance and other parameters. Seeing what is happening inside our car will let us have a even better feel for its baseline and know when things are not behaving normally. Our Boxster is fifteen years old and heading toward 150K miles. Being able to keep an eye on it wirelessly? Awesome! We found the LELink OBD II reader and app to be a very functional pair. Setup was quick and the app was easy to use. The combination gave us the info and features we needed to work effectively with our local mechanic and make informed repair choices. Being able to do all that with our smartphone means we will no longer have to boot up our 12-year old PC just to read the codes and reset the CEL!!! Got one of this, works great. Did read all the trouble codes.